Installing PiXPlaneFMCCDU Software | Life, The Universe and ... Everything! This is a guide on how to install my Pi X-Plane FMC CDU Software, for use with the Pi FMC CDU Printed Circuit Board (PCB) I designed. Thanks to all the testers who provided feedback and corrections to this guide. EADT's x737-700 and x737-800 (freeware) with Javier Cortes's x737FMC (payware). Anything else I get my hands on that supports input and output to external hardware. Source code is available at https://github.com/dotsha747/Pi-XPlane-FMC-CDU. If you are using a wired network interface, connect the Raspberry Pi to your network switch. 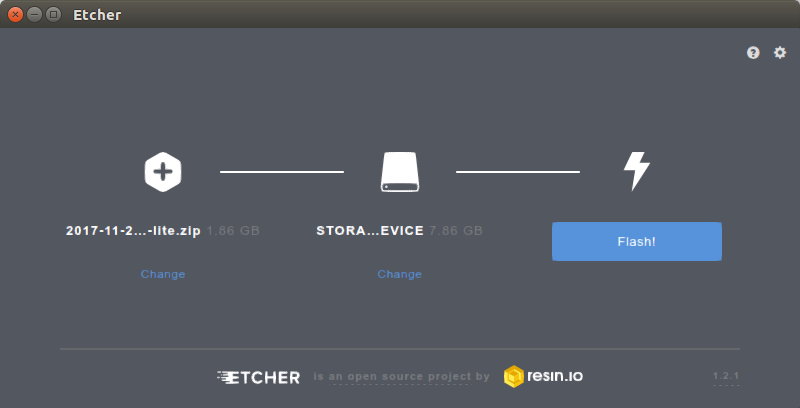 Download Raspbian Stretch Lite from https://www.raspberrypi.org/downloads/raspbian/. Make sure to download the "Minimal/Lite" image, and not the Desktop image. Pi XPlane FMC CDU software needs direct access to the graphical framebuffer, and having a windowing/desktop layer gets in the way of that. The version I used was "2017-11-29", but it should work with a later version. Click "Select Image" and choose the Raspbian Stretch Lite image you downloaded earlier. If your image is flashed properly, you will see the "rainbow" screen, followed by a number of console messages. Finally a login prompt will appear. This means your Pi is expecting you to type in a command. Select "Yes" and press ENTER to reboot. 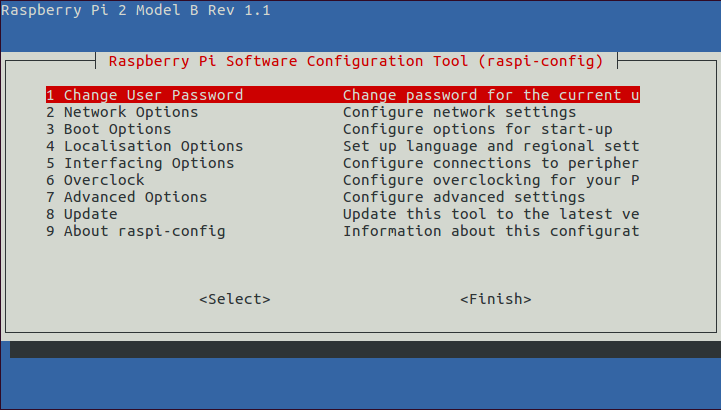 login as user "pi" and password "raspberry"
It is advisable at this stage to login to your router and configure a fixed DHCP IP assignment to the raspberry Pi. This is not strictly required but will help with troubleshooting. Restart the Pi after you've done this so it acquires a new IP address. Raspbian comes set up for a UK locale and keyboard. If you're using something else (quite likely if you don't have a "£" key on your keyboard) then you will need to change it. Not doing this will give you problems typing certain characters such as the double-quote and pipe symbol. Press space on your locale. If you are unsure, try "en_US.UTF-8.UTF-8". Press Tab and select OK. Select your keyboard model. If you are unsure, try "Generic 105-key (Intl) PC" and press OK. Select your keyboard layout. If you are unsure, try "English (US)"
Select "English (US)". Press Tab followed by OK. Select "The default for the keyboard layout". Press Tab followed by OK. Select "No compose key". Press Tab followed by OK.
Press Tab followed by FINISH. sudo bash -c "echo 'export LC_ALL=en_US.UTF-8' >> /etc/profile"
The prompt should return without any output. At this point your keyboard should be fully functional, and you should be able to type the double-quote (") and pipe (|) characters normally. Depending on your display you may need to manually configure the screen resolution, by using raspi-config, "7. Advance Options → 5. Resolution" or editing /boot/config.txt directly. You should probably also change the password for the user pi. You can do this by using raspi-config, "1. Change User Password". Connecting to repo.shahada.abubakar.net (repo.shahada.abubakar.net)|115.132.31.45|:80... connected. The prompt should return without any output. Need to get 0 B/6,000 B of archives. Selecting previously unselected package pi-xplane-fmc-cdu. The installer will also install any other packages required by pi-xplane-fmc-cdu. It is probably a good idea to make sure your FMC hardware is working properly before proceeding to use it with the simulator. Two test programs are included to check the functionality of the keypad and the LEDs. Make sure that the main FMC program is stopped and not running when you execute these two test programs, weird random results will occur otherwise. The testFMCKeypad program tests the functionalty of the keypad, and in particular the matrix circuit. It is useful to read http://blog.komar.be/how-to-make-a-keyboard-the-matrix/ to get a better understanding of how a matrix keyboard works. In particular, the keypad design I used does not handle simultaneous keypresses (to do so would require a diode on every keyswitch). For the purposes of an FMC CDU simultaneous keypresses are not required. The first mode, known as "readall", shows the state of the inputs, when each output line is enabled (set to 0). In the above example, pressing the EXEC key causes GPIO input 3 to becomes 0 when GPIO output column 1 is enabled. The second mode, known as "scanning" causes the keypad to be scanned and he results displayed continuously. To exit this mode, press Control-C (using the console keyboard). Here is a session where the CLR key is pressed once, followed by a demonstration of what happens when multiple keys are pressed simultaneously. Scanning keyboard ... press any key on the FMC keypad to test. Press Control-C (on the regular keyboard) to abort. Test to make sure that each individual key generates a unique row and col value, and that only one key is detected for every press. Also make sure that for each key press only a single press is registered. The software has some features to prevent the switch "bouncing". If there are 0s in the input when no keys are being pressed, you have a short to ground somewhere. If there are multiple 0s in the Input section when a single key is pressed, you probably have a key stuck in the pressed position. This is possible if the you have fixed the the faceplate to tightly to the PCB. Check that each key has a "click" feel when pressed. The screws that mount the faceplate to the PCB should have three nuts, the first to fasten the screw to the faceplate, and two more that can be adjusted to hold the PCB at exactly the right distance. The testFMCLED program tests the functionality of the LEDs. Note that on powering up the Raspberry Pi, it is normal for the LEDs to be in a random state, with some lit and some unlit. This is because the control signals that switch them on or off have not been configured as outputs by the software yet, and so they are in an undertermined state. The first second indicates which LED to control, and the third word determines whether that LED should be set to on or off. At this point, all the LEDs should be off. Now turn them on one by one. The LEDs should light up one by one. The Pi X-Plane FMC CDU relies on the ExtPlane plugin to communicate with the X-Plane flight simulator. You will need to download and install the "Ext-Plane Plugin" software onto your Flight Simulator PC. 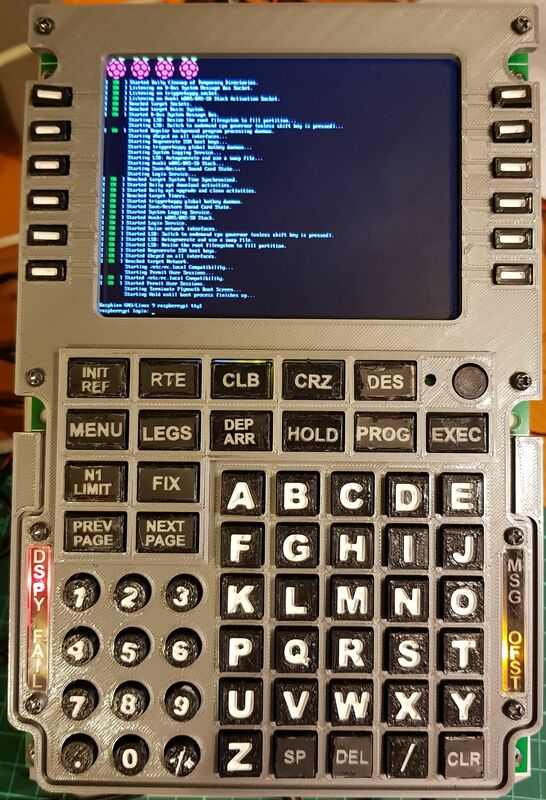 Note that you do not need to install the "Ext-Plane Panel" for the FMC CDU to work. Be aware that there are terms and conditions associated with the usage and redistribution of this software. It is licensed under the GNU GPL V3 license, which can be found here https://www.gnu.org/licenses/gpl-3.0.en.html. The Pi X-Plane FMC CDU application searches your network for running instances of X-Plane, so as long as the Pi X-Plane FMC CDU is connected to the same WiFi or LAN as your flight simulator, you do not have to do any configuration. The following screen appears while waiting. 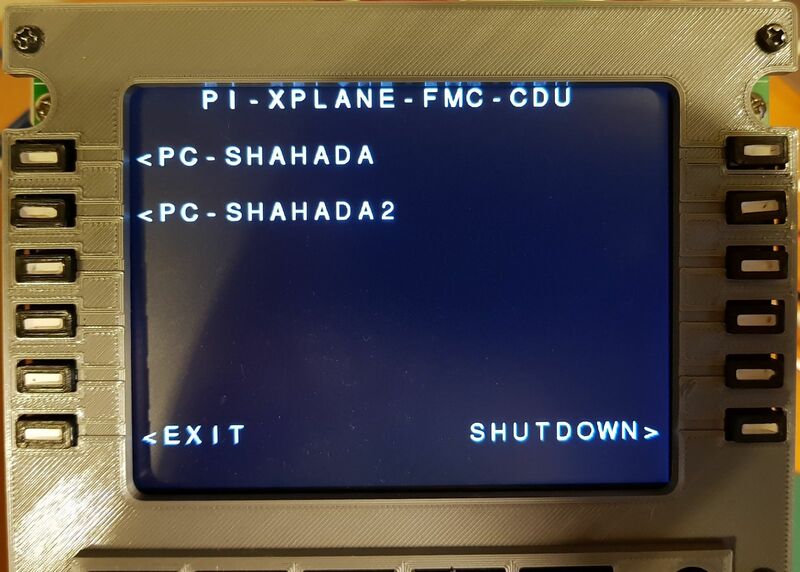 Pressing the LSK6 (Left Soft Key 6, the button pointed to by the EXIT message) will cause the Pi X-Plane FMC CDU software to exit and return you to the shell. Pressing the RSK6 (Right Soft Key 6, the button pointed to by the SHUTDOWN message) will shutdown the raspbian operating system on the Raspberry Pi. It is recommended that you do this before switching off the power to the device. 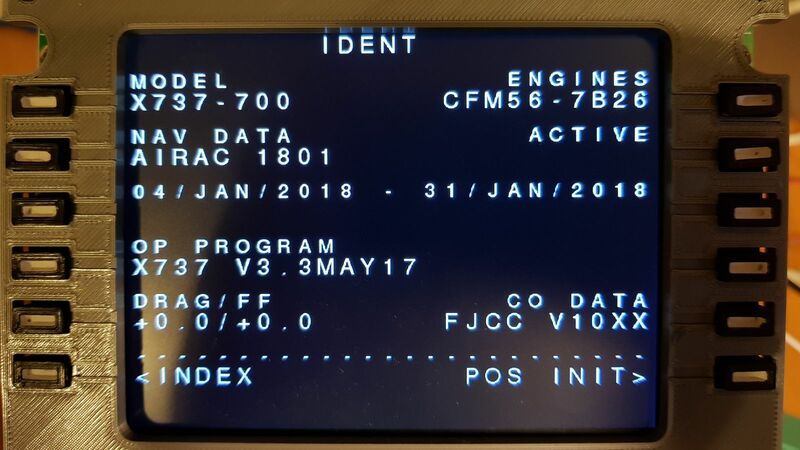 When a running instance of X-Plane has been detected, the name of the computer it is running on will be displayed on the left side of the screen. Press the LSK next to the PC name that you wish the Pi X-Plane FMC CDU to connect to. 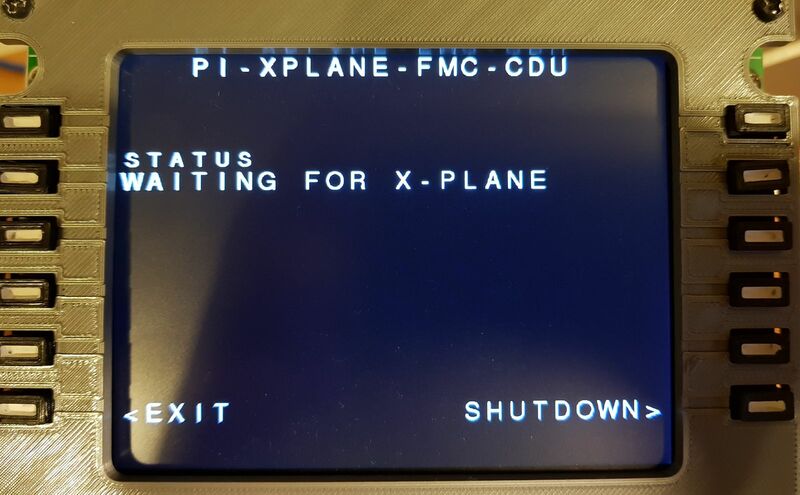 Once the Pi X-Plane FMC CDU establishes a connection to the EXTPlane plugin running in the flight simulator, the "<" symbol will change to a "*". If you press the LSK but do not get a "*", it means that there is a problem connecting to the EXTPlane plugin. Be sure to allow the connection (TCP port 51000) if you have a firewall running on the PC, or disable the firewall completely. If you have connected to the wrong PC by mistake, simply press the RSK of the correct PC to change the connection. 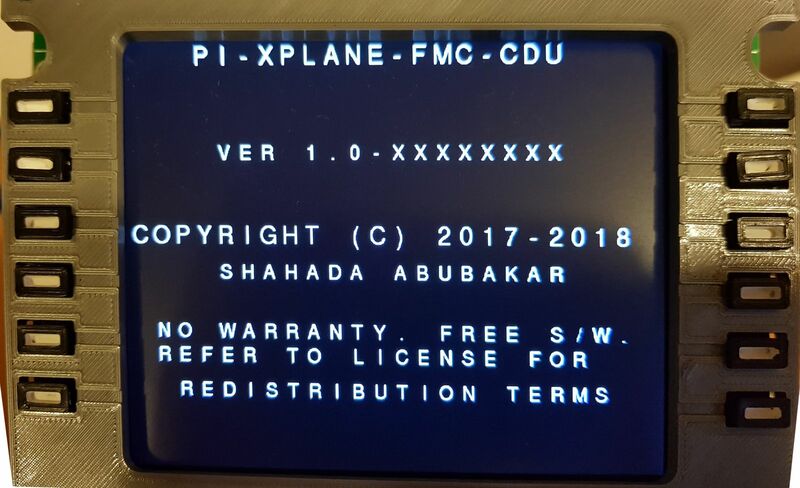 The Pi X-Plane FMC CDU will now check to see what FMC software is available in the flight simulator. This will depend on what FMC Software you have installed, or what aircraft you currently have running. Select the FMC you wish to use by pressing the appropriate RSK. The ">" symbol next to the selected FMC will change to a "*". The EXEC key light will also illuminate. Finally, press the EXEC key to begin using the FMC CDU. The next screen displayed will be that of the FMC you have selected, mirroring the one in the flight sim. From here on, pressing any of the keys on the FMC CDU will cause the same key to be pressed within the flight sim, and the screen to be updated accordingly. 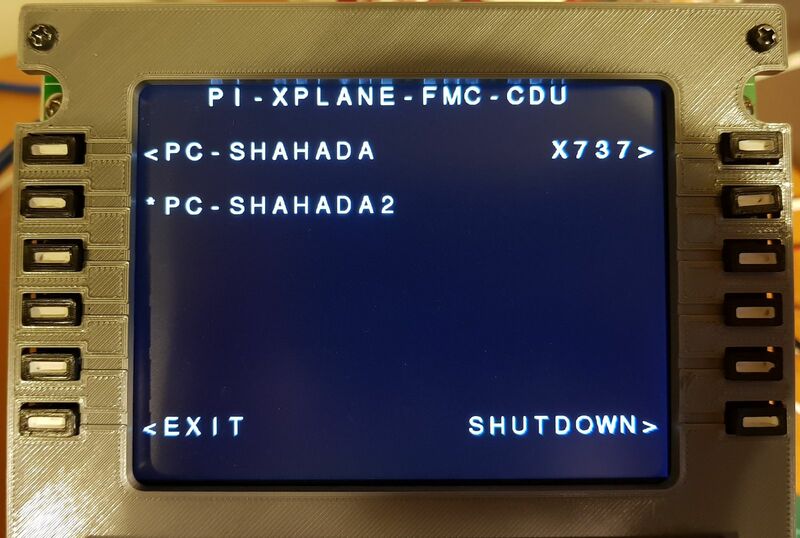 At any time, you may return to the Pi XPlane FMC CDU screen by holding down the CLR key for more than 2 seconds. To return to your flight simulator's FMC Screen, press the EXEC key. Alternatively, you may choose to switch to a different FMC, a different PC, Exit or Shutdown. 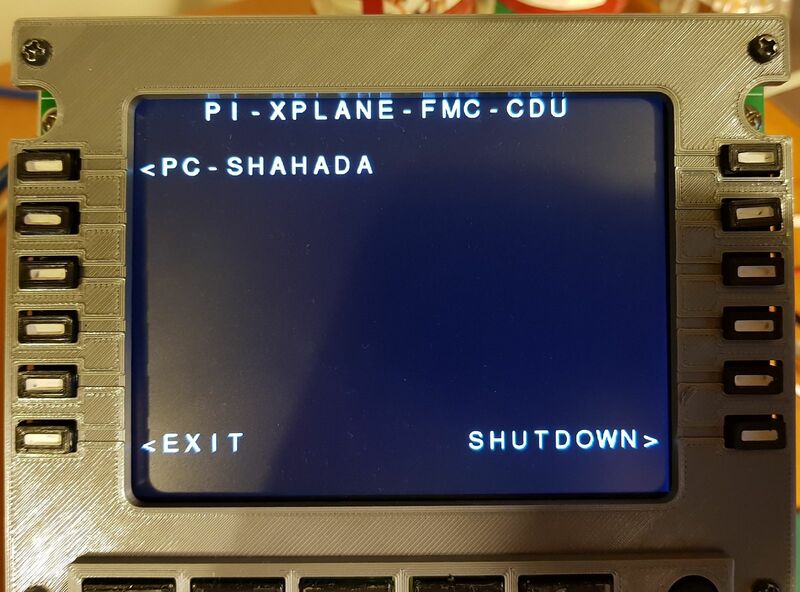 The next time you switch on the Pi, the Pi XPlane FMC CDU will start automatically. 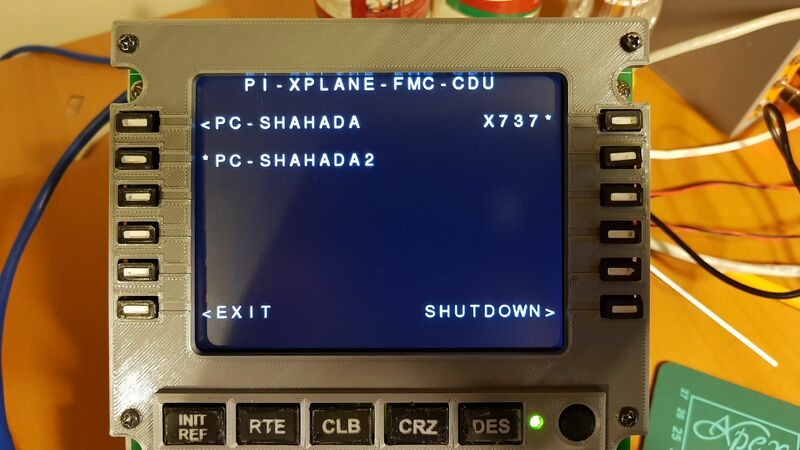 Choose "" to leave the Pi XPlane FMC CDU.